Take away: If you're into pocket pens, minimalist design, or retractable pens-- the pico may be a great pen for you. With a few bright color options, this pen is perfect for tossing into a bag and fishing out with ease. I have a problem with pocket-sized pens-- I can't get enough of them. I love being able to slip a pen into my jeans pocket and how this small object that fits in the palm of my hand can extend into a full-sized pen in two twists-- or one click (as I'll discuss in this post). The expanding nature of the pen is a very gratifying to use. To extend the pen just push on the rounded back section. You'll feel it as the spring-action mechanism extends the body a couple of inches. To close it you just click on the rounded back section and it will magically shrink, and the ballpoint tip will retract. There's a small, raised, rectangular plastic piece on the side of the pen that prevents the cylindrical pen from rolling off when placed on a table. The pico is similar in shape and size compared to the Fisher Space Bullet Pen and Kaweco Lilliput. This is a great talking-point pen. Try showing this pen to a friend-- they probably won't know what it is at first. Once you have the pen fully extended most everyone goes, "Wow, that's really cool!" then they'll want to write with it. Writing with this pen is smooth and steady. In the hand the pen feels cool to the touch and a bit slippery. When writing, it will probably rotate in your hand, but because it's uniform in shape on all sides of the pen, it won't be bothersome. Due to the rounded shape of the pen and lightness, it's not suitable for long writing sessions. If you use it for jotting down notes or messages, you're golden. These pictures were taken with the Laser Orange pico. I think it's a bold, fun color that will stand out in a dark bag, purse, or in between the couch cushions. 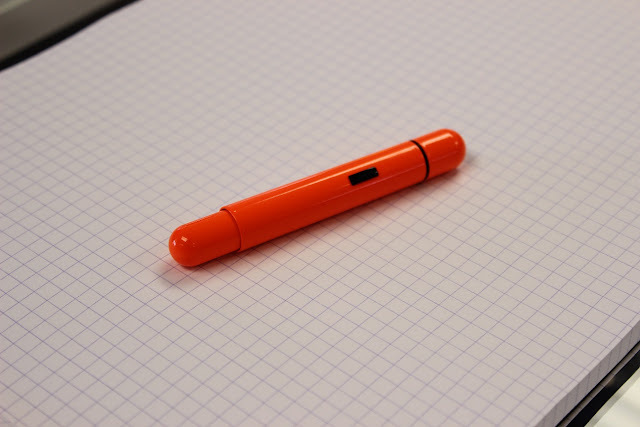 In addition to Laser Orange, this pen is also available in Chrome, Chrome Matte, White, Red, Black, Imperial Blue, and Wild Rubin (a glossy red). The pico takes the L22 (compact ballpoint refill), which is easily available anywhere you can purchase a LAMY pen. Give us a call or shoot us a message if you want to talk pens or if you have any questions about the pico! Labels: Lamy, Lamy Pico, Pocket Pens.